Eugene Knappen came to the Richland, Michigan area in the 1800’s and began farming. He eventually moved away from farming and took over control of a country elevator in Richland. 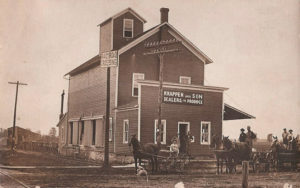 During the time of running the country elevator his son Charles B. Knappen Sr. joined him and began working at the elevator. During this time a lumber mill was in operation in Augusta, Michigan. Established in the 1836, mill burned in 1846 and was rebuilt as a flour mill. In 1929 the mill was known as the Augusta Milling Co. and was under ownership by a group of local farmers and Dr. William Upjohn (founder of Upjohn Co.). Dr. Upjohn convinced Charles Knappen Sr. to purchase the milling company who ran the mill as a flour mill for the first year before adding a bran line in 1930-1931. Mr. Knappen Sr. also expanded his country elevator business to other locations in Schoolcraft and Hastings, Michigan, before selling them prior to World War II. Charles B. Knappen Jr. joined the family business in 1946 after his discharge from the Army and took over for his father in 1962 after his fathers’ death. Charles B. Knappen III joined the family business in 1972 and became President in 1979. In 2014 Emily (Knappen) Likens joined the business as a member of Board of Director and became President/CEO in 2018. As the fourth generation of the Knappen family, Emily looks forward to leading and growing the business started by her Great Grandfather. 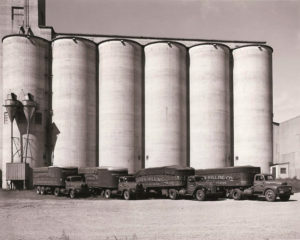 Expansions in 1938, 1941, 1946, 1952, 1963, 1966, and 2010 have increased the flour capacity from 300 cwt. per day to 5,200 cwt. Copyright © 2019 Knappen Milling Co. All Rights Reserved.